The community is invited to the Annual Open House at Decatur Healing Arts on Sunday, May 1 from 2 until 5 p.m. The Open House will close at 5-6pm with a full one hour Sound Healing Meditation with Jon Adams on Flute and Tibetan Bowls. 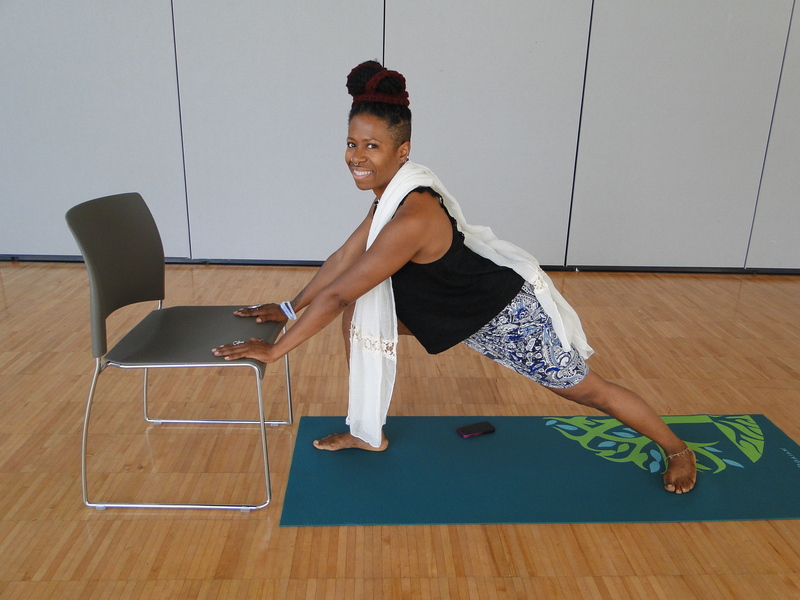 A full schedule is available HERE –Demos and Classes are $5 to drop-in. Decatur Healing Arts is located 619 B East College Ave, Decatur, in East Decatur Station. Explore the headwaters of Glenn Creek and Glenn Creek Nature Preserve. Decatur Active Living and the Pedestrian Advisory Committee invites the community to join us for the March Sunday Stroll on Sunday, March 20. This month’s walk will be led by Neil Norton. Join us as we explore the headwaters of Glenn Creek. This walk is 2.37 miles and will take us through this beautiful and sometimes challenged watershed and will include going through the Glenn Creek Nature Preserve. The walk begins at the Decatur Recreation Center at 2 p.m. Bring your camera and take some great nature photos! 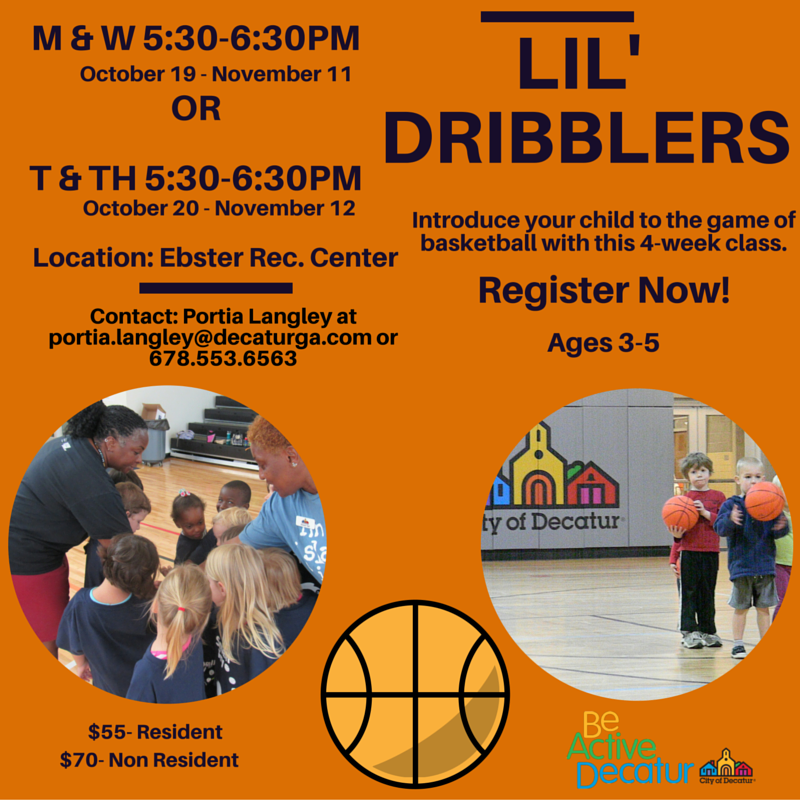 For more information contact Cheryl.Burnette@decaturga.com. 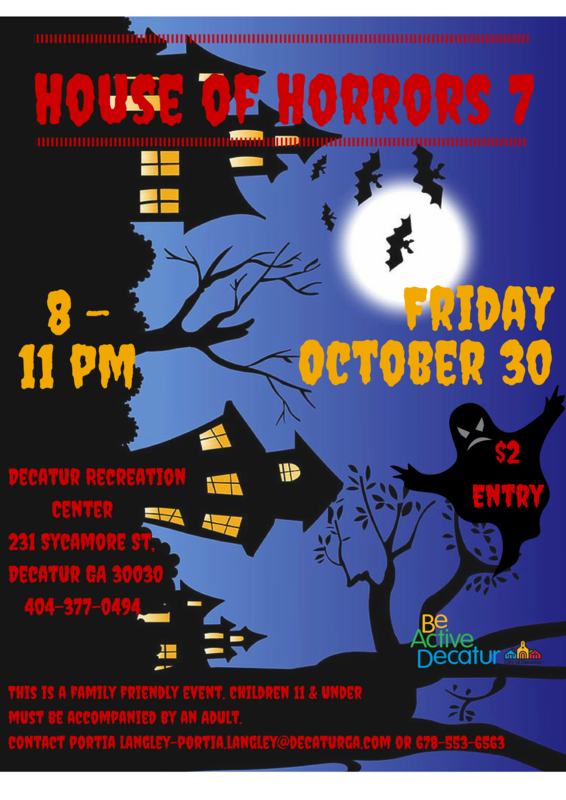 Halloween Haunted House at Decatur Recreation Center! 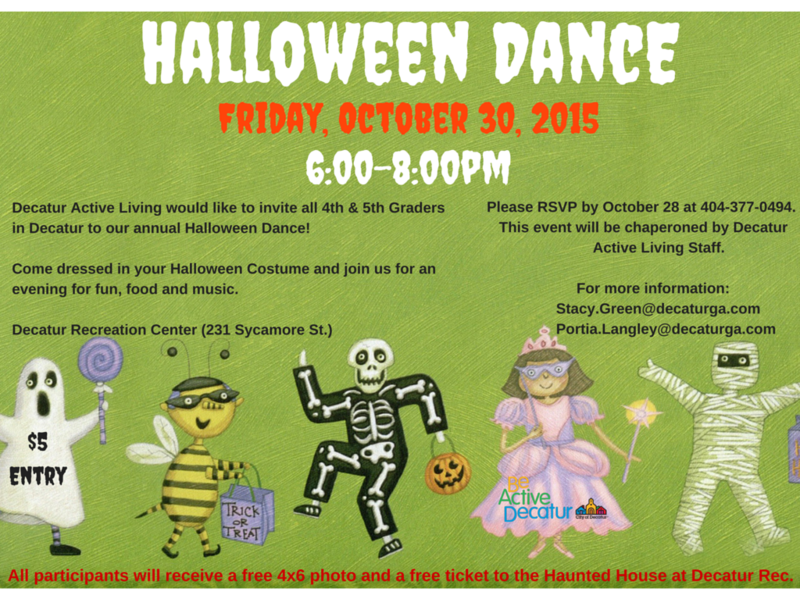 Inviting all 4th and 5th graders to the Halloween Dance at Decatur Recreation Center! Note: Glenlake Pool is not open during the week. 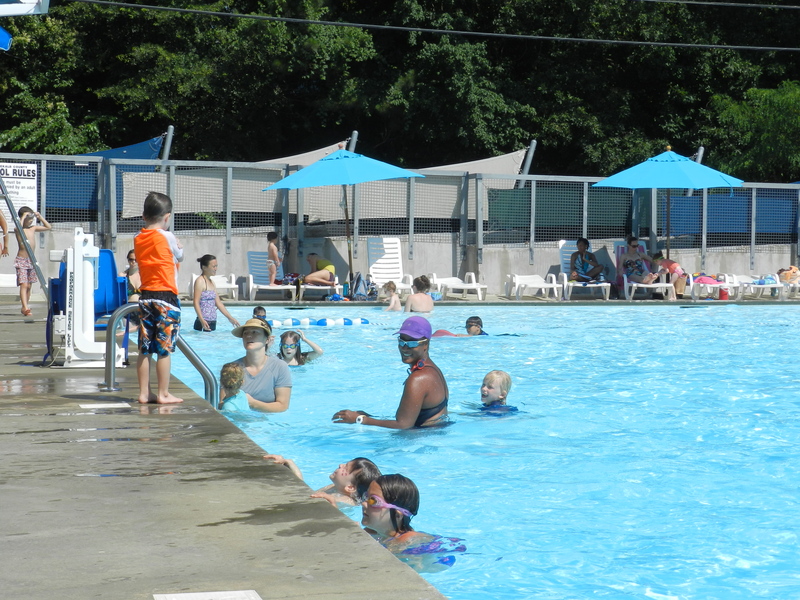 Ebster Pool and McKoy Pool closed for the pool season on Monday, September 7. If you have additional aquatic questions please call Jabari Cole at (404) 377-7231. 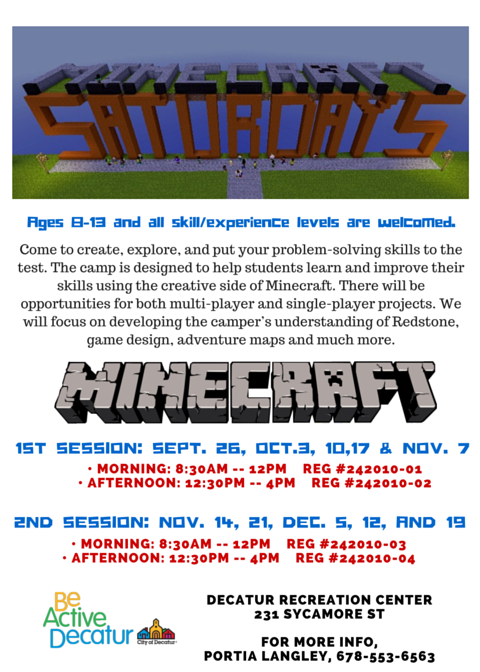 Register now for Minecraft Saturdays! Teen cooking class graduates at Ebster Recreation! 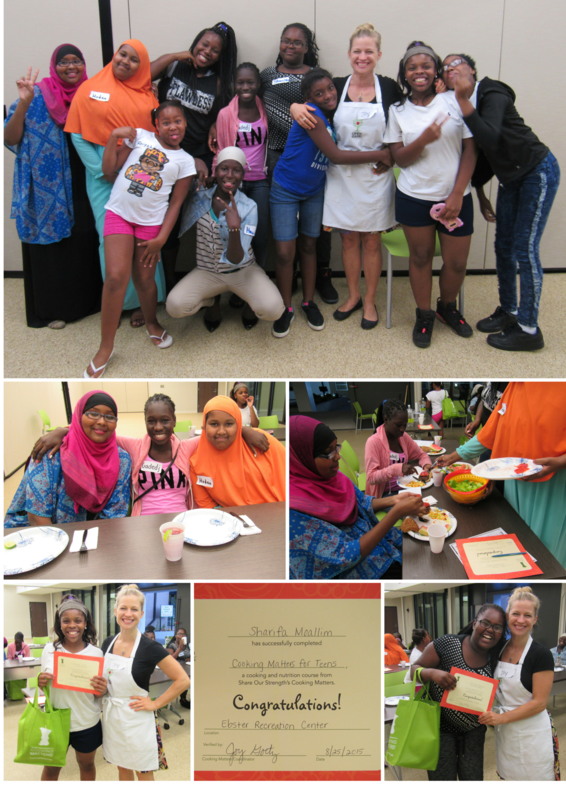 The Ebster teen cooking class sponsored by Cooking Matters-Open Hands came to an end last night. There were 10 girls to graduate from the program. This 6 week program focused on meal preparation, grocery shopping, food budgeting and nutrition. Teen participants took home a bag of groceries at the end of each class. Classes were taught by a volunteer chef and nutrition educator. Cooking Matters has been featured by First Lady Michelle Obama’s Let’s Move! campaign and recognized by the U.S. Department of Agriculture for excellence in nutrition education. Ebster girls truly enjoyed this class and are thankful to be a part of the Cooking Matters community. Wondering what’s new this season, and waiting for the playbook to arrive in the mail? Well here is your sneak preview. We’ve got fitness, dance, learning, and more for the mind, body, and spirit. Walk With a Doc features docs of Podiatry, Pediatric Hypertension, CranioSacral Therapy, Arborist, Meditation, Chiropractic, and more new specialities every week. And of course many of our regular classes for adults are returning, so find the class that works for you and start your Fall off with a new commitment. Most of our classes all run for 4 weeks and then repeat monthly, but a few are 6 or 8 weeks long.